We are conflicted about this campaign from The Sun. Raising greater awareness of domestic violence is absolutely essential. Far too many people believe that domestic violence is something that happens to "those women" and most rarely consider who perpetrators actually are. The media rarely gives accurate coverage to the reality of domestic violence: that 1 in 4 women experience it during their lifetime; that less than 40% of single incidents are reported to the police but they still receive 1 phone call every minute; or that 2 women a week are killed by a current or former partner. In pure economic terms, domestic violence costs 23 billion pounds a year. This cost is the minimum since public services do not "collect information on the extent to which their services are used as a result of domestic violence". It doesn't include the cost of family court and legal aid where women are forced into giving abusive fathers contact with children or the fact that many of the children living in poverty in the UK do so because their fathers refuse to pay maintenance (financial child abuse). Media coverage of domestic violence ignores the human cost to women, children and men: to their physical and emotional health and the impact on extended families (some of whom are also perpetrators). We want the media to increase coverage of domestic violence and we want to see them raising the issue of funding. Chronic underfunding of specialist women's services, including refuges, are putting the lives of women and children at risk. Well-funded refuges are necessary to support women, but these refuges must be run by specialist organisations who have the appropriate training to effectively support women. Far too often recently, specialist service providers have lost their contracts with local councils to housing associations who are simply incapable of adequately supporting women and children. This cannot go on. And, we need the media to make it clear that investment now will not only save lives but also impact on the costs to the economy in the future since the government has made it clear they care more about the budget than people. 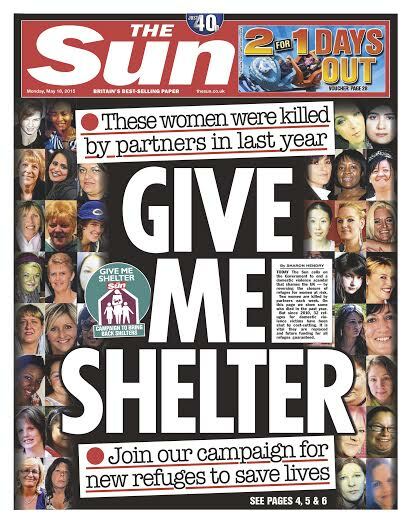 The Sun has a huge readership and can raise awareness in ways that Women's Aid simply cannot. Obviously, there are questions that need to be discussed and, if The Sun are serious, there are further steps they need to take to convince us they fully understand the links between media representations of women, racism, classism, male entitlement, male privilege and male violence. There is real conflict between The Sun running a campaign raising awareness of domestic violence and them running a story entitled "First pic of body in boot mum Claire O'Connor". Using terms like "body in boot" to refer to a woman murdered by her partner is dehumanising. We would like The Sun to take the next step and insist that all of its journalists undergo specialist training on how to write accurately about violence against women and girls by following the very basic guidelines sent out by the National Union of Journalists. We want The Sun to commit to more than just a front page story. We want to see them stop using inaccurate and misleading language which excuses perpetrators and blames victims. We want them to recognise that their support for the Conservative party during the last election will put more women and children at risk due to funding cuts to refuges, education, social work and the NHS. The very reason that refuges are in dire straits is because of continuous slashes to their budgets at the local and national levels. Austerity is literally killing women and children. The Sun have the power, due to their large readership, to raise real awareness of the desperate need for more refuge spaces, but they need to do more than raise awareness. They need to take responsibility for changing the language they use when reporting on violence against women and girls. If The Sun want us to believe they are committed to ending violence against women and girls, they need to prove it. This has enunciated exactly my reaction today to this campaign. I couldnt believe my eyes when i noticed this on Twitter last night. Its in direct conflict with the way that publication treats women within its pages. As well as the obvious objectification involved with page 3 (and lets not forget how Reeva Steenkamp was treated by them after she died) there is also the way they treat women from lower down the socio economic scale. They have demonized single mothers in the past as “scroungers” Which does NOT create a supportive climate for a woman to leave an abusive man. Coupled with the fact that they support the Conservative Party who have been the main driver behind these cuts, i can only conclude that this is a publicity stunt. Women do need money to escape situations like these, which is something that this paper seems to begrudge women having, especially if they are single mothers. At the moment i am of the mind that this is a publicity stunt. I hope i am proved wrong! Thank you for putting into words why this campaign conflicts you. I agree with every word you say. I really hope that the Sun takes up your suggestions on training. They may understand that domestic abuse is wrong. But they may not have recognised that their attitudes are part of the culture that has caused the abuse. Whilst I agree with the main text of this argument I am getting a little tired of hearing that only women’s aid can support survivors. I work for an organisation that supports survivors and it’s not WA, our standards are high in both quality of delivery to survivors and knowledge of staff who deliver the services. There needs to be choice and diversity in the sector, provided it’s of good quality, you are encouraging and advocating a “closed shop” style which could be reflective in theme of an “old boys network”…also many of the organisations you say are not “specialist” are indeed members of WA and pay said fees??? I’m one of the lucky ones I got out!